No, really. I thought it was a joke. Which demographic is Mattel appealing to? Who wants to play with a Palm Beach Sugar Daddy Ken Doll? 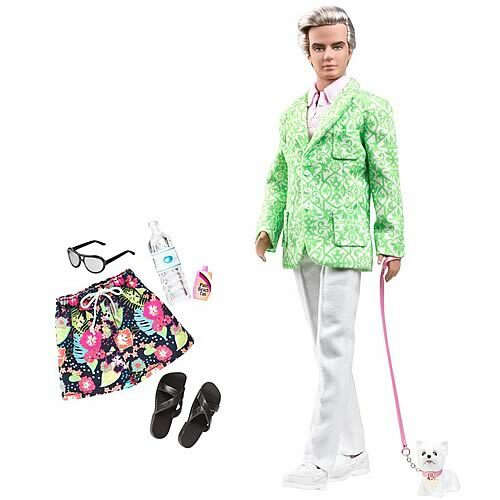 Gee, I would have thought the PERFECTLY FABULOUS accessory for this Ken would have been GI Joe on that little pink leash! OMG, what in the name of God was Mattel thinking about? This is totally repugnant, and an offense to damn near everyone, straight, gay. or whatever. Seriously, how do you really feel? Wow ! ” I ” wouldnt be offended for one & the other thousands of Barbie Collectors that wanted him. By the way, he is now cancelled. BUT he was NEVER intended to be played with by children ! He was to be a Silkstone Collector Doll. They are NOT for children, they are Collector dolls. Who are you to judge what OTHER people like or collect ? The demographic they are appealing to, COLLECTORS ! Of every race, sexual preference, etc. . These are ADULTS NOT KIDS ! This Ken was highly anticipated by Collectors & now we arent getting him. So you folks need to find yet another thing to pick on. I don’t find this doll offensive. As a matter of fact, you have to wonder about people that do. IT IS A DOLL! Is he going to wave a magic wand and turn you into a frog or something? Do you not have anything better to do in your life but pick on a doll? I was reading this and asked myself WTF? Get a life people! Believe me, she does not have a lesser life. Then my question would be : Why bash things that others want to buy or what others make ? If its not to your taste, great. But why do you need to attack a doll ? If you dont like the product, just dont buy it. But dont fuss so that people that do want it cant buy it. i really wanted this doll…i’m so sick and tired of mattel making “young” ken dolls…that karl lagerfield ooak was very cool, looked like tommy lee jones…yes, this is meant for collectors not children…you don’t spend $100 on a child’s ken doll, which i would have spent on this one….but i did go and pay $200 to have two similiar kens rerooted so i have two silkstone kens that look like this…i don’t really understand why people would care what other adults spend their money on, this makes no sense to me…i mean, i’m a grwoneup…so what’s the big deal if i want a sugar daddy??? doesn’t everyone???lol!!! oops, i meant “grownup” lol…i’m a grownup but i can’t spell heh heh…really not my fault, that little black column to the right covered it up, i usually proofread anything i post.